Zach & Jenn are the most happiest people I have ever met. They have this awesome outlook on life and so much joy that it is contagious. Luke and I absolutely loved being able to photograph their Fords Colony Country Club Wedding. Their day was absolutely gorgeous. Surrounded by their family and friends it was a beautiful celebration! Also, let me also mention the cute little flower girl who looked like Moana! Absolutely adorable! The golf course was gorgeous! We love shooting at Ford’s Colony. Fords Colony Country Club is an award winning venue for your wedding day! This venue is located in Williamsburg Virginia and close to Colonial Williamsburg. The grounds there are so pretty and the sunsets are amazing too. I also love that our friend Shay is there coordinating weddings. She is top notch and always takes such great care of her couples! I get so excited because we always get our own little golf cart and get to explore with the bride & groom at sunset. One thing that I loved was when the best man spoke. He said some great things but one thing he said I could definitely see in Zach. The best man said that Zach might not have a large quantity of friends, but the ones he does are family. If you get close to him he will invite you in to be part of his family. Jenn is the same way. They both wear their hearts on their sleeves and they fit together so perfectly. Furthermore, Zach & Jenn have the warmest of hearts and it was such a joy watching them become husband and wife. To the newlyweds, Luke and I cannot thank you enough for trusting us to capture one of the happiest days of your lives. We wish you many more and we congratulate you! Most of All, A Big Thank-You to all these vendors! Another wedding at Fords Colony can be seen below! 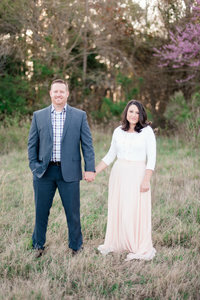 To See Jenn & Zach’s Engagement Session visit below!